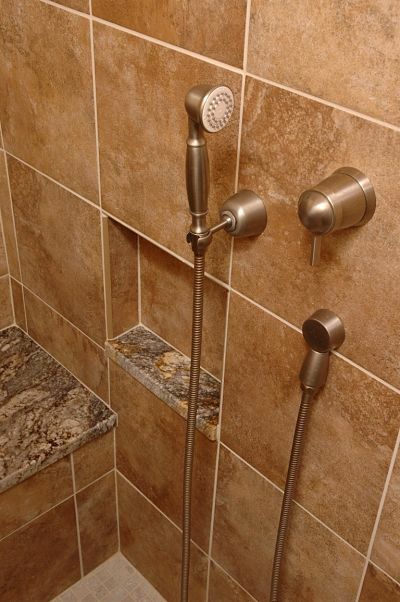 When remodeling a bathroom, more homeowners are adding walk-in showers. They often will replace a tub with a walk-in shower. Walk-in showers have many advantages. They can be designed with or without doors. They are more accessible than a tub/shower combination because of low or level thresholds. 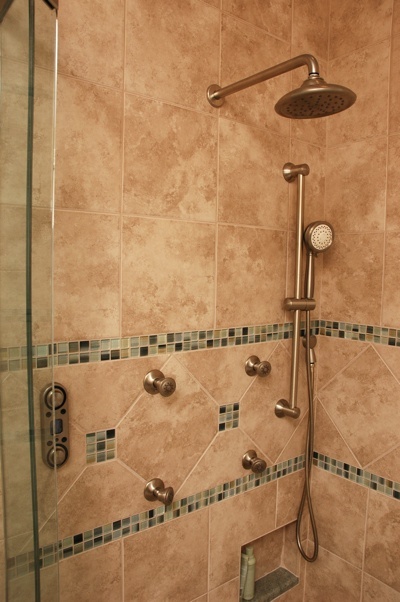 And, many showerhead and accessory options can add comfort to make a shower as relaxing as a warm bath. One of the most important fixtures in any shower is the showerhead. A hot trend in bathroom design today is adding multiple showerheads in various combinations to create a spa-like experience at home. You may want to consider an energy saving showerhead that uses less hot water. Showerheads are rated by the amount of water used per minute. An efficient showerhead is one that uses 2.5 gallons per minute (gpm) or less. Most people choose a standard wall mount showerhead for their bathrooms. Wall mounted showerheads are adjustable and come with settings to control the flow of water. There are many sizes, styles and finishes to choose from, including the popular rain showerheads. Ceiling or top-mount showerheads provide an overhead spray of water. 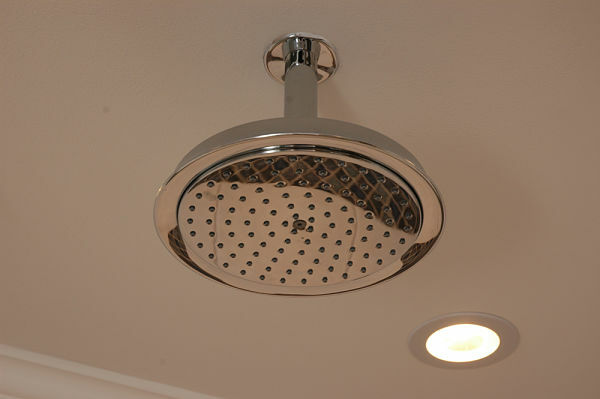 Rainfall showerheads were made to be mounted on the ceiling. Manufacturers offer them in a range of shapes and sizes and some are designed to be flush-mounted. A handheld showerhead is attached with a gooseneck hose and can be a primary showerhead in a shower stall or a second showerhead for rinsing your hair, washing young children or cleaning the shower stall. When coupled with a standard showerhead, turn on both showers together and you will feel as though you are in a spa. 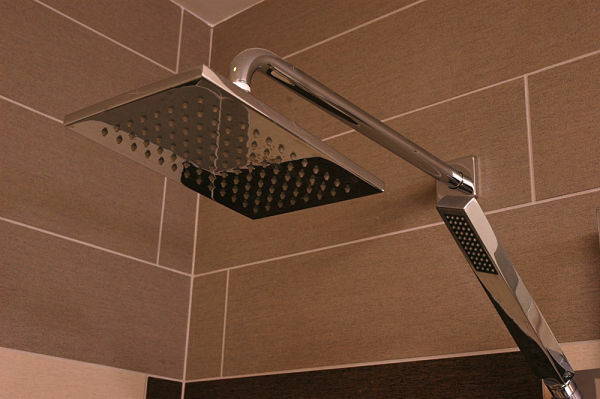 Handheld showers can be wall mounted on a rod and adjusted to your height. Wall mounted body sprays can add to the comfort of taking a shower. They are installed in custom baths. Some come with adjustable heads to control the force of the water and create a gentle mist or a massage shower. Sprays can be jetted or rain showerheads. Body sprays should be installed according to your height. Heights of all users should be considered. The lowest spray should be knee height, the middle spray waist height and the upper spray shoulder height. When mounted on opposite walls, the sprays cross. 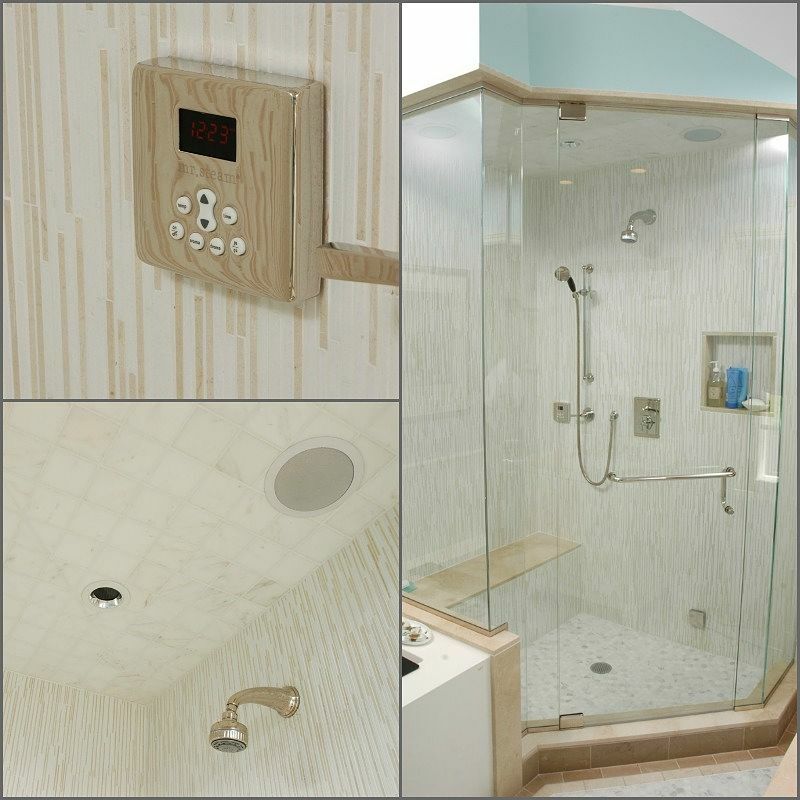 Kohler has many innovative designs for the shower. The latest is a showerhead with wireless speakers to play your favorite music. Kohler’s “Moxie” showerhead is also eco-friendly and uses 2-to-2.5 gpm to conserve water. Steam baths are the ultimate home spa experience. The steam can be soothing and adds moisture to your skin to make it smooth and supple. There are other benefits of steam especially if you suffer with sore muscles, arthritis, asthma or sinus problems. 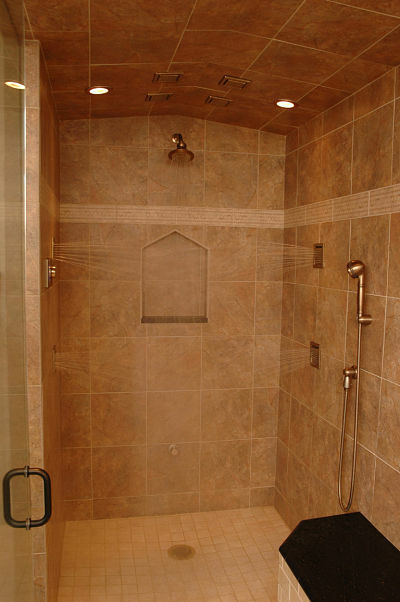 To install a steam bath, the shower must be fully enclosed and the recommended height of the enclosure is 8 feet or less. A shower bench is also recommended. Multiple showerheads can be added for those days when you don’t have time to enjoy a relaxing steam bath.